Which Cartridge Heater Sheath Do You Need? http://jobcosupply.com/wp-content/uploads/2015/05/jobcologo.png 0 0 Jennifer http://jobcosupply.com/wp-content/uploads/2015/05/jobcologo.png Jennifer2015-07-02 14:03:112015-07-02 14:31:36Which Cartridge Heater Sheath Do You Need? Duraflex 1022° F/ 550° C Excellent all around wire. Flexible, easy to strip. Not waterproof. Standard on all cartridge heaters, band heaters, strip heaters. Optional on silicone rubber heaters. Teflon 482° F/ 250° C Easy to pull through conduit, abrasion resistant, waterproof. Smaller OD than other wire types. Standard on silicone rubber heaters. Optional on all others. Silicone Rubber 302° F/ 150° C Very flexible, water proof. Nicks easily. Optional on all heaters. Forms excellent moisture seal when used with RTV potting. Braided Silicone Rubber 392° F/ 200° C Very flexible, waterproof. More abrasion resistant than plain silcone, but less so than other types. Standard on nozzle heaters, optional on all others. HPN Cord 194° F/ 90° C Inexpensive, compact two conductor cord. Sometimes called lamp cord. Optional on all heater products. SJO Cord 194° F/ 90° C Available in 2 or 3 conductor. More rugged than HPN cord. Also available with molded plug. Optional on all heater products. Swaged in leads are ideal for applications where there is a lot of movement or the leads must be bent sharp upon exiting the heater. Standard lead wire type is Duraflex wire, rated to 550 deg C. Other lead wire types are available. Crimped on leads are generally used where the temperature at the end of the heater exceeds the maximum rated temperature of the lead wire. Since the connection between the leads and power pins is made outside the heater, the unheated length at the lead end of the heater is kept to a minimum. Crimped on leads are not recommended for applications where the leads must be bent sharply near the heater, or in applications where the leads will be subject to a lot of flexing. For flexing applications, a welded on connection would be better. The high temperature connectors are covered by 1- 1/2″ of 2500 volt silicone rubber coated fiberglass sleeving. 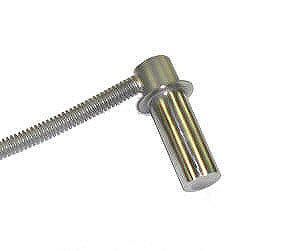 Also called screw terminals or stud terminals are used in applications where easy lead replacement is desirable. They work great with ring terminals or fork terminals. Post terminals are only available on 1/2″ diameter heaters and larger. Terminals are #6-32, other sizes are available. Right Angle Leads are ideal for applications where space is limited. leads are covered with silicon impregnated fiberglass sleeve where they exit the heater. Provides excellent abrasion protection while allowing the leads to be bent in a tight radius. Because the braid is swaged in, it is extremely resistant to pulling out of the heater. Right angle stainless steel braid offers the same advantages as swaged in stainless steel braid, but allows use in tight spaces. When ordering, please specify the overall length. Also known as armor or hose, Stainless Steel Flexible Conduit provides maximum lead protection from abrasion, but can not be bent quite as sharply as stainless steel braid. Conduit is swaged into the heater for maximum durability. Unlike standard conduit, convoluted conduit is sealed and provides complete water resistance at any temperature, while forming a positive seal against contamination entering the heater. It is available on standard 5/8″ and 3/4″ diameter cartridge heaters. In most cases, Convoluted Conduit is brazed directly to the heater. Convoluted Conduit is best used in applications where moisture or contamination is an issue. Located to the left, see close-up cross-section of convoluted conduit.